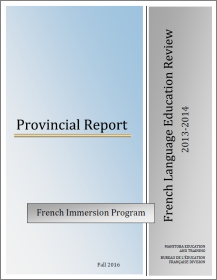 This document is the first Provincial Report under the French Language Education Review – French Immersion Program. It was prepared by the Bureau de l’éducation française Division (BEF). The Report presents a compilation and an analysis of the data collected from the 2013-2014 School and Divisional Questionnaires with responses by all 105 French Immersion schools and all 22 school divisions offering the French Immersion Program in Manitoba. It provides a comprehensive profile of the French Immersion Program, highlighting the schools’ and school divisions’ perceived successes and challenges in the delivery of the French Immersion Program. Furthermore, the BEF's analysis of this data determined what should be prioritized going forward in order to ensure student success.